To be fair, Saint Patrick was born in Britain, not Ireland. He was the first Primate of Ireland and he had no prehensile tail. Everyone is Irish on Saint Patrick’s Day. 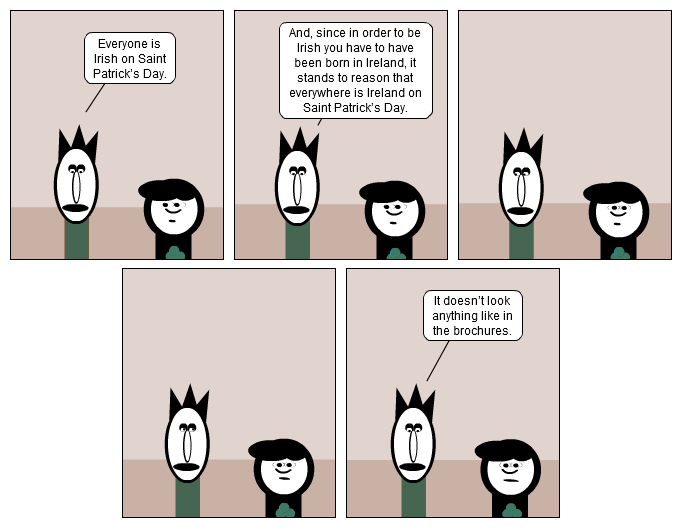 And, since in order to be Irish you have to have been born in Ireland, it stands to reason that everywhere is Ireland on Saint Patrick’s Day. It doesn’t look anything like in the brochures. Try being Irish in the desert. I wasn't born in Ireland, but have Irish roots. My mum's mom came from Ireland when she was a teenager. My mom was born on St. Paddy's Day, too. Displaying 6 out of 6 comments.